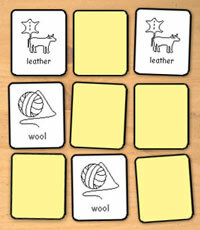 Pairs/Pelmanism cards can be used to help develop pupils reading skills. The symbols will help some pupils remember and understand the words. A memory card game in which a pack of cards is spread out face down and players try to turn up pairs with the same symbol, symbol and word or word. Most of the curriculum resource packs include vocabulary cards in both symbols or text, but if not, it is easy to edit the symbol/word cards to remove the symbol to make picture/word matching pairs rather than same style matching.